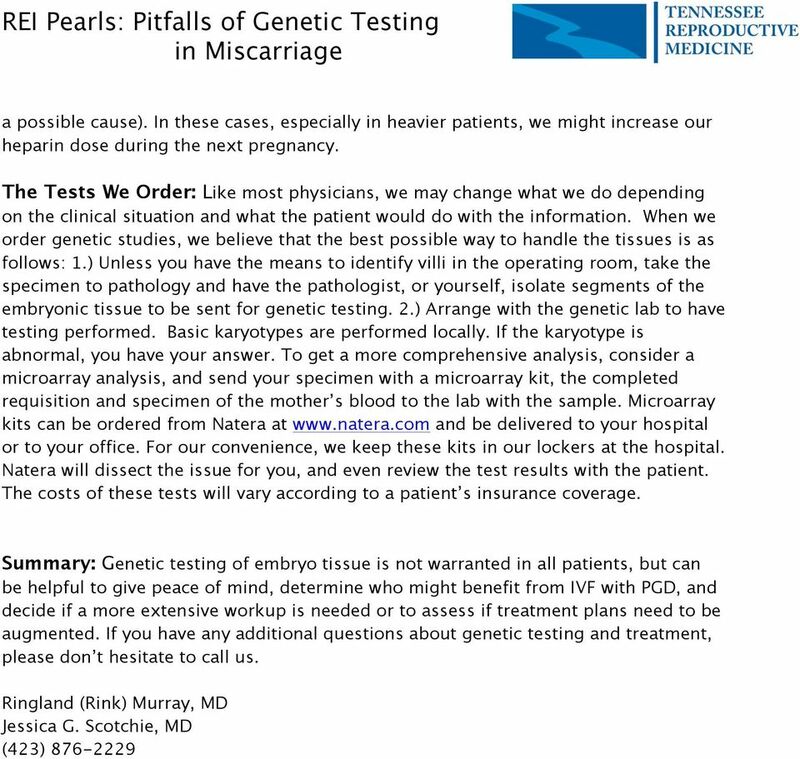 Download "REI Pearls: Pitfalls of Genetic Testing in Miscarriage"
1 The Skinny: Genetic testing of miscarriage tissue is controversial and some people question if testing is helpful or not. This summary will: 1) outline the arguments for and against genetic testing; 2) describe the available genetic tests; and 3) discuss what we do with the information we obtain. 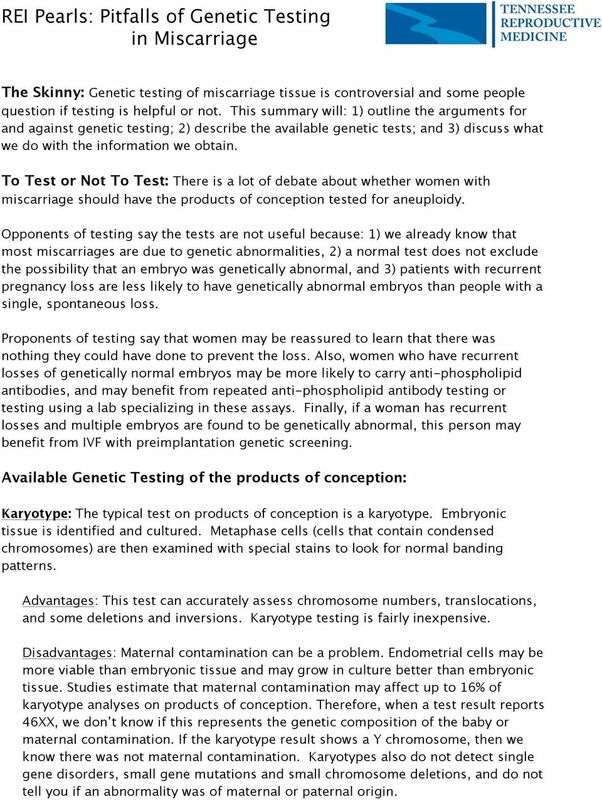 To Test or Not To Test: There is a lot of debate about whether women with miscarriage should have the products of conception tested for aneuploidy. 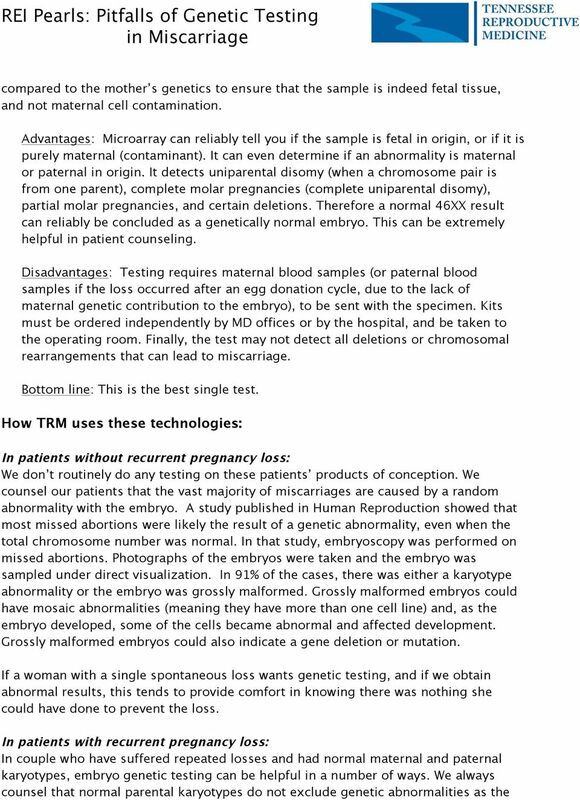 Opponents of testing say the tests are not useful because: 1) we already know that most miscarriages are due to genetic abnormalities, 2) a normal test does not exclude the possibility that an embryo was genetically abnormal, and 3) patients with recurrent pregnancy loss are less likely to have genetically abnormal embryos than people with a single, spontaneous loss. Proponents of testing say that women may be reassured to learn that there was nothing they could have done to prevent the loss. Also, women who have recurrent losses of genetically normal embryos may be more likely to carry anti-phospholipid antibodies, and may benefit from repeated anti-phospholipid antibody testing or testing using a lab specializing in these assays. Finally, if a woman has recurrent losses and multiple embryos are found to be genetically abnormal, this person may benefit from IVF with preimplantation genetic screening. Available Genetic Testing of the products of conception: Karyotype: The typical test on products of conception is a karyotype. Embryonic tissue is identified and cultured. Metaphase cells (cells that contain condensed chromosomes) are then examined with special stains to look for normal banding patterns. Advantages: This test can accurately assess chromosome numbers, translocations, and some deletions and inversions. 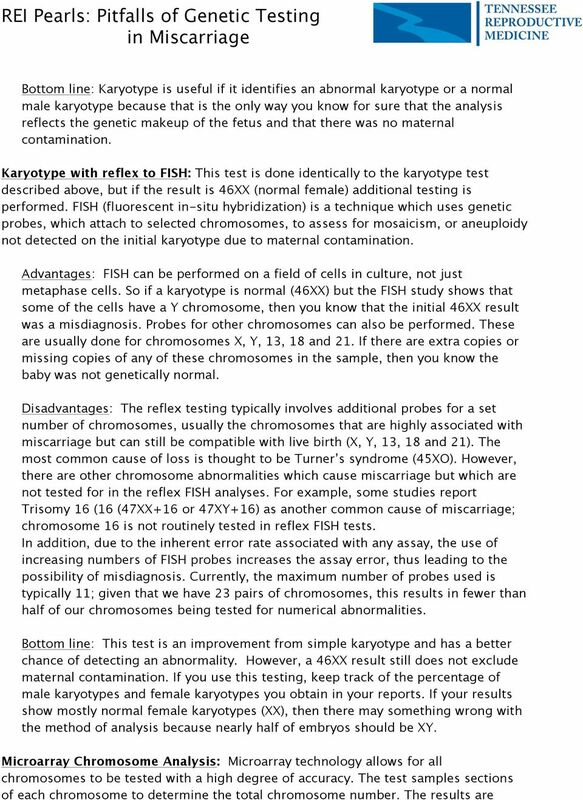 Karyotype testing is fairly inexpensive. Disadvantages: Maternal contamination can be a problem. Endometrial cells may be more viable than embryonic tissue and may grow in culture better than embryonic tissue. 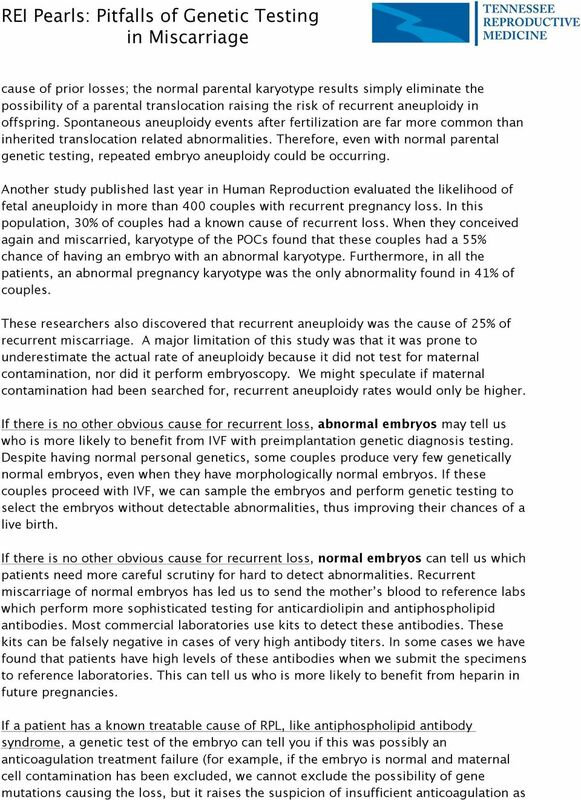 Studies estimate that maternal contamination may affect up to 16% of karyotype analyses on products of conception. Therefore, when a test result reports 46XX, we don t know if this represents the genetic composition of the baby or maternal contamination. If the karyotype result shows a Y chromosome, then we know there was not maternal contamination. Karyotypes also do not detect single gene disorders, small gene mutations and small chromosome deletions, and do not tell you if an abnormality was of maternal or paternal origin.